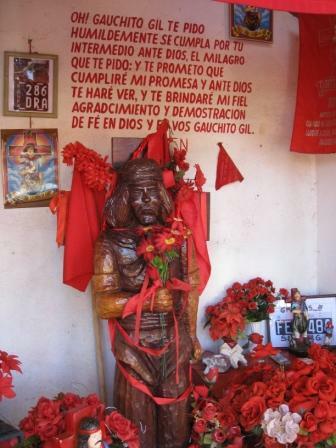 Outside Puerto Iguazu in northern Argentina, we walked past a little red altar set up on the side of a highway. I didn’t want to get close to it because the little red flags tied to it, whipping in the wind, reminding me of a little voodoo shrine. I’m superstitious enough to keep my distance from crude, handmade altars with burned out candles and beer bottles littering the floor. My first thought was that it was a shrine to acknowledge a person who died at that spot. E. wanted to get a closer look. To get to Iguazú, we took a bus (linea Rio Uruguay) and tried out the “cama suite.” This is a cushy, reclineable seat that turns into a bed at night. It was super comfortable, but the bus goes from side to side at night on the road. If you are a light sleeper, you’ll wake. The “cama suite service” was nice. The waitress served hot meals with salads and wine or beer. The trip by bus was 16 hours, overnight. We stayed at the Rio Tropic hotel about 5 minutes outside of town. Though it’s outside of town, this location has advantages. If you like a more tranquil atmosphere, it’s down a quaint dirt road. 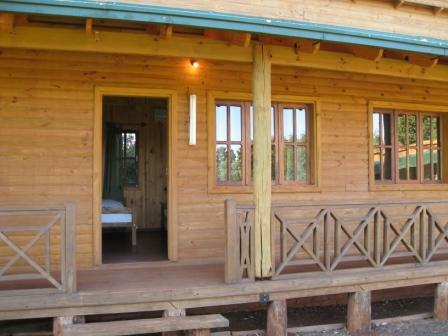 The accommodations are a year old and super clean. There is a swimming pool and free Internet (shared laptop). The breakfast is freshly squeezed orange juice, cafe con leche, yogurt, facturas (danish), and medialunas. The owner speaks Spanish, English, and French. Rio Tropic is a ten minute walk from the bus stop to the waterfalls. 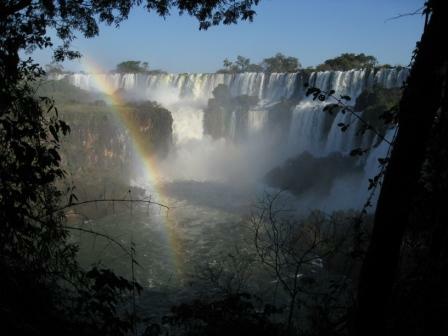 Last weekend we visited Iguazu in the province of Misiones, Argentina. 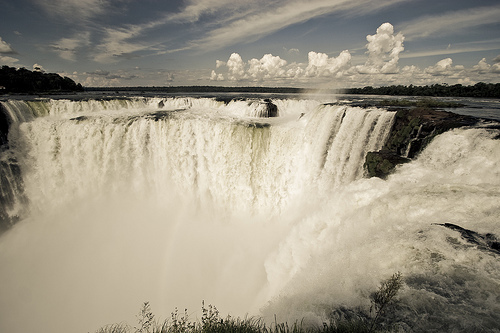 Misiones is situated in northern Argentina. Puerto Iguazu borders at Brazil and Paraguay. The waterfalls are amazing on both the Argentinean and Brazilian sides, though we only were able to visit the Argentinean falls (called cataratas). The Brazilian side is said to offer more glimpses of wildlife. On our hike, we saw monkeys, butterflies, various sizes of rodents, and coatis. 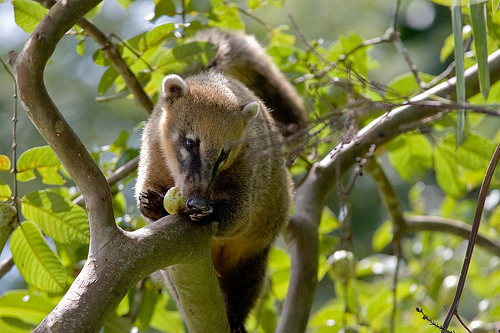 Coatis, like scavenging raccoons, roamed the park–eager for tourist handouts. Some tourists were happy to oblige, despite warnings to the contrary. Some even petted them! I strongly advise against this. These photos provide a glimpse of what we saw. 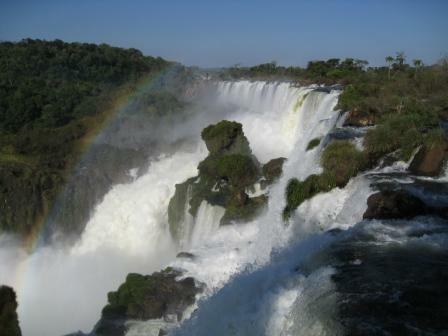 See my updated post on Traveling to Iguazú.